TRESA STREET is most definitely country. She was born in the south and grew up in the small country town of Portland, Tennessee. She has done what most successful artists have done: discovered her love of music, developed her talent and is living her dream. Her mother lays claim that Tresa sang before she could talk. At the tender age of three, Tresa began singing in church, where her great grandfather preached, and she also sang at all the local fairs and festivals. While doing that Tresa explored all kinds of musical styles, and fell in love with them all, Country Music being her heart of hearts. 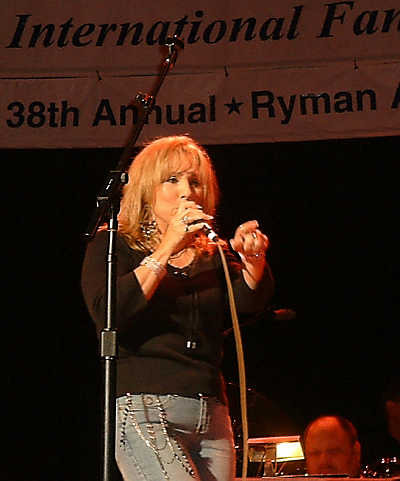 A radio DJ once read that Tresa had said her musical heroes were Tammy Wynette, Loretta Lynn, along with Tina Turner and Cher. When he asked her how could this be possible, Tresa explained that she admires all these women, not only for their talent and music, but because through good times and bad, they stuck to their dream. Their music like hers, comes straight from the heart. When Tresa sings a love song, such as her radio single �Naturally", you know she's singing about a real true love. When she gets rowdy and sings the somewhat humorous country Blues song �Rockin' A Baby�, about a man that just won't grow up, you somehow know she has been there, done that. She tells of her dreams and thousands of others just like her, in her recording of the timeless �I Believe I Can Fly�. Then turns around and rocks the house on �Wild About You�. Her music, like Tresa herself, is the real deal. Her producer has created a musical style that is fresh and new and compliments her own personal style. You won't find a lot of meaningless politically correct fluff, just true blue emotion set to music. 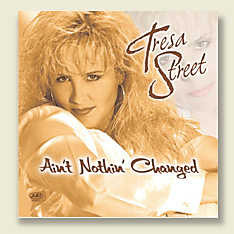 Tresa is a true female singer, songwriter, and performer. She has lived, loved, laughed and cried. She has known the joy of true love, she has felt the ecstasy of passion and she has suffered the pain of losing. When she writes it's from the heart, when she sings it's from her soul. You will seldom ever hear her sing or write in the third person, that is to say about "other people". There is not a lot of she, her, they, or them in her songs. She is always about I, our, my and us. So, whether you're young or old, like Country music, Pop or even the Blues, you're going to love Tresa & her music. Her modern country style of writing is about love, romance and life that everyone can relate to. If you haven't had the opportunity to hear her music or see her perform, we are sure that when you do, you will become an instant Tresa Street fan. She is truly an original! FIRST, BUT NOT THE LAST! Tresa Street has re-released Baby It�s You, which was previously available only on vinyl records. When the album was originally released in 1996, promotion of the album was cut short when Tresa�s mother was involved in an accident, and Tresa put her career on hold to care for her. Known as one of today�s modern country artists, Tresa does not limit herself to just one style. She writes songs in a modern country style about love, romance, and life. She has known the joy of true love; she has suffered the pain of losing; she has felt the ecstasy of passion. When she writes, it's from the heart; when she sings, it's from her soul. 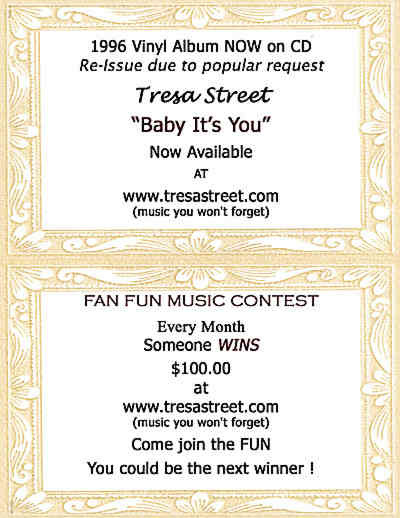 Tresa Street is all about music, �music you won�t forget�, all kinds and all styles. With her charismatic looks and musical energy, she is very appealing to both men and women. She is truly an original!